Will Castor Oil Harm My Plants? Castor oil is a vegetable oil extracted from the seeds of the castor bean plant. The clear or light green oil is frequently ingested for its laxative properties and is also used in the commercial production of many skin and hair care products. A less common use of castor oil is as a garden pest deterrent, applied directly to soil, grass and plants. Castor oil has a distinctive odor and unpleasant, nauseating flavor, but is not harmful to plants. Castor oil can deter garden pests. Castor oil is derived from the Ricinus commus plant, typically found in warm climates like those of India and Brazil. Castor oil contains ricinoleic acid, oleic acid and linoleic acid. It is sometimes used as a home remedy to treat such problems as constipation, yeast infections, acne, sunburn, ringworm, wrinkles and inflammation. It is also used to induce labor in pregnant women. Castor oil can be used to stop moles and other small rodents from burrowing and building hills in outdoor vegetable gardens. Castor oil prevents moles from building mole hills. Castor oil is an eco-friendly way to prevent moles from burrowing and building molehills in lawns and gardens. Search your lawn and garden for mole tunnels and hills, and pour castor oil around and inside any that you find. You may want to dilute the castor oil with water to conserve the oil--the result will be just as effective. As a preventative measure, place castor oil around the entire outline of your lawn to keep moles out. When dealing with garden pests like moles, there are several alternatives to castor oil. 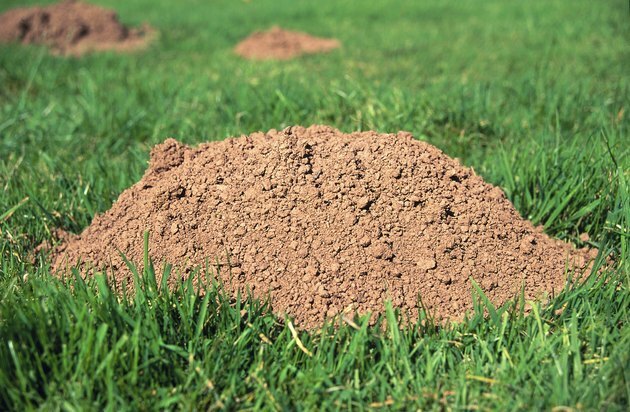 You may consider mole traps, either homemade or commercially manufactured, available for purchase online or in garden stores. Another alternative is to flood the mole tunnels using water from your garden hose. Yet another option is to construct a barrier around your garden using some type of fencing like chicken wire, making sure to bury the barrier far enough underground that the moles cannot burrow beneath it. Castor oil can be poisonous to humans if ingested in large enough doses. Dosages exceeding more than a teaspoon per day can cause severe intestinal distress, including pain, vomiting and diarrhea. Be sure to consult a physician or pharmacist before ingesting castor oil as a home remedy, and follow any directions printed on the package. If you suspect castor oil poisoning, call a poison control center as soon as possible.